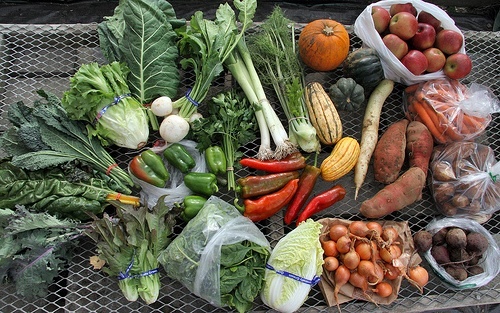 Shared Harvest is an extended season Community Supported Agriculture program for late fall meals and winter storage. Shares are distributed once per month in October, November, December, January and February. You can choose to sign up for just one month or more, up to 5 months. Many people sign up for all 5 months! Share Size: Shared Harvest is geared to people who cook for themselves most of the time, and is also great for people who eat (or juice or ferment) a lot of veggies. Each month you get enough produce to last for typically a month of meals for either a household of 4 moderate veggie eaters, or for 2 people who cook, juice, and/or ferment a lot of veggies. Many of our shareholders plan on eating their share contents well into the spring months, as most of a winter share consists of storage varieties of veggies, including garlic, onions, sweet potatoes, turnips, carrots, potatoes, etc. which store for weeks and months in cool conditions (See our Storage Tips and Recipes menu for more info, plus with each month’s share, we advise you on what conditions are ideal or good for each of the share veggies.) We aren’t able to offer split or half shares, and encourage people to find others they know to split a share with, if desired. Again, many of the veggies store well, so we even have single people who like to cook getting a whole share on their own. That said, we can often help you find a share partner if you send us an email. Share Contents: We include a nice variety of cold-season veggies (+apples!) in the share. Here’s a typical list for the season: apples, beets, broccoli, bok choi, Brussels sprouts, cabbage (green, red and napa varieties), cauliflower, carrots, celeriac, collard greens, dried beans, escarole, fennel, garlic, kale, lettuce, leeks, onions (red and yellow varieties), parsnips, pie pumpkins, peppers (green and red), potatoes, popcorn, radicchio, rutabagas, salad turnips, sweet potatoes, Swiss chard, spinach, two kinds of winter radishes and butternut squash. You can read about what has been in past Shared Harvest shares by looking through the blog archives for the months of October, November and December. Here’s a link to summaries of contents of the winter share from recent years. Each month’s share costs $95. Early Bird signup by May 15 gets a discount of 10%, making the per month cost $85. Confirmed locations and dates for 2017-18 season are below. For the later months when wintery weather is most likely, we move the outdoor Arlington pickup to Winchester’s Wright-Locke Farmstand. (i.e., as the farmstands close down their regular business in Oct or Nov., and the weather gets colder, the farmstands become available to shelter our winter CSA pickups). To sign up for a share, use our online signup form. The signup form covers a lot of the details, but please email the marketing and distribution coordinator, jane [at] sharedharvestcsa [dot] com, if you have questions or if you are a returning member, you can just send a payment with a list of the months you’d like to get a share this year. Payment options include check in the mail and online credit card (via Paypal). We also have an option to pay for your share in 2 installments (only available with payment by check in the mail). This option is provided so that folks can sign up early and help the farmers be more secure in their planning, while allowing the shareholder to pay the balance at a later date.